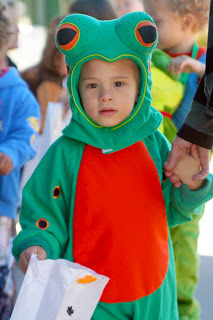 This past Thursday was Connor's Halloween party at school. Before they went Trick-or-treating they all sang a Halloween pumpkin song. Connor of course knew all the words but he didn't sing at all. He did the hand motions, but Mr. Shy Guy didn't sing along. After their sing-a-long they went to all the class rooms and trick-or-treated with the teachers. It was good practice knocking on the doors and saying "Trick-or-treat" and "Thank you". After Trick-or-treating was the party! All the kids got a cookie and icing and were supposed to put together a jack-o-lantern with the candy. All the kids loved the cookies and Connor was determined to eat all of his in one piece without getting his hands dirty. It was very tricky, but he mostly managed. You can really tell he's working hard in the picture with the other kids. After the cookie time they played a game where they threw a hoop into a pile of candy. Whatever was in the hoop they got to keep! Connor was very patient waiting for his turn and only got two pieces of candy, but he had a lot of fun with it.